This series grew out of my longtime fascination with herbs and their multitude of uses: culinary, medicinal, ornamental, magical, practical. Herbs appear in gardens, in fields and along roadsides, in teas and tinctures, in medicine cabinets, cultural histories, and ethnobotanies. They have mesmerizing names that (with a little tinkering and twisting) promise murderous plots: Spanish Dagger, Bleeding Hearts, Dead Man’s Bones, Widow’s Tears. They offer poisonous histories, bushels of fascinating folklore, and tantalizing insights into human ingenuity. Who, for instance, discovered that indigo would yield its deep blue secrets only if people peed on it? Who first learned that Queen Anne’s lace is a powerful contraceptive, or that rue steeped in a strong thyme tea could induce an abortion? Who figured out that red-hot peppers can actually freeze pain signals to the brain? I didn’t know any of this interesting stuff when I started the China Bayles series back in 1992, and learning what I need to know about a particular plant and its many cultural manifestations has been my very special delight. For me, the research for each book is the equivalent of a grad seminar in botany, ethnography, pharmacology, kitchen magic — and crime, of course. In Wormwood, for instance, I repurposed the history of a real Kentucky Shaker village and its inhabitants, using Shaker narrators, documents, journals, and newspaper clippings to recreate the historical crises that defeated the most dedicated herbalists of the American 19th century. For A Dilly of a Death, I visited a real pickle factory and learned where not to put a dead body. In Bittersweet, I found out more than I wanted to know about invasive species and exotic game hunting in Texas. Ditto Blood Orange and Medicare fraud. In Queen Anne’s Lace, I discovered why this wilding has proved so valuable in family planning over the centuries, and at the same time, so dangerous. I’m hooked on learning — and lucky for me, there are plenty of readers who want to learn what China Bayles loves to teach. In fact, one of the things that got China’s series off to a bang-up start was its early appeal to what we were just beginning to call “niche markets.” Back in the 1980s and ’90s, mysteries were still pretty generic, appealing mostly to people who liked to read, well, mysteries. Most of what was on the market back then were puzzle plots involving private eyes, and police procedurals, with a few series set in mystery bookstores and libraries. But Thyme of Death (China’s first adventure) appealed to people who liked to garden and who dreamed of opening their own shops. Witches’ Bane appealed to New Age readers with a yen for magic. Hangman’s Root (another name for catnip) appealed to animal lovers and readers with a social conscience. I know this sounds a little simplistic, but one reason for the series’ perennial appeal was its early ability to reach and hook readers who didn’t know they liked mysteries until they got hooked on China and her sidekick, Ruby Wilcox. But China Bayles isn’t my only gardening series. I love writing historical fiction, and in 2010, I began the Darling Dahlias mysteries, featuring a garden club in the small Southern town of Darling. The series is set in the Great Depression, when times were tough, jobs were scarce, and people gardened to put food on the table and make something beautiful out of a handful of seeds and a few passalong plants. The series of seven books, soon to be eight (www.darlingdahlias.com), focuses on gardening as a way of creating community, making and keeping friends, and practicing self-reliance and personal independence. It is also (and not incidentally) a look at change and growth in a small Southern town during a difficult decade. My work has changed, too, over the three-plus decades I’ve been a full-time writer. I began as a pseudonymous author of young adult novels: I wrote as Carolyn Keene, Franklin W. Dixon, and Francine Pascal, among others. I graduated to adult nonfiction and mysteries under my own name in the early 1990s, with Scribner, Berkley, and Avon. 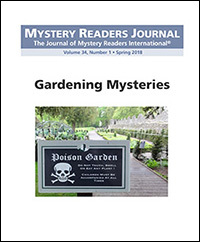 For 25 years, Berkley has published the mysteries: the China Bayles series, the Cottage Tales of Beatrix Potter, the Darling Dahlias, and the co-authored Victorian/Edwardian series I wrote with my husband Bill under the name of Robin Paige. More recently, however, I’ve created my own imprint, Persevero Press. I began using it in 2013, when I published A Wilder Rose, about the life of Rose Wilder Lane and her work on the Little House books that were published under her mother’s name. In 2015, Persevero Press published Loving Eleanor, the story of Eleanor Roosevelt’s 30-year friendship with journalist Lorena Hickok. In 2017, I used Persevero to publish The General’s Women, the love affair of Dwight Eisenhower and his wartime aide, Kay Summersby. This year (2018), I’ve begun publishing my mysteries via Persevero, with The Darling Dahlias and the Unlucky Clover in March and The Darling Dahlias and the Poinsettia Puzzle in October. In 2019, Persevero Press will begin publishing the China Bayles series — and who knows what else. Having my own imprint gives me the freedom to experiment, both in print and in digital/audio formats. Gardens grow — but not by themselves. As Rudyard Kipling famously said, “Gardens are not made by singing ‘Oh, how beautiful,’ and sitting in the shade.” In a garden, every year throws you a new curve ball. There are droughts and then there are floods. The deer jump the fence and eat your tomato plants. Bugs wax and wane (but mostly wax). Weeds invade. But through it all, plants persist. That’s one of the lessons they teach us, as gardeners and as writers and readers. Love something long enough and hard enough, and it will thrive. Work at it regularly enough, and it will persevere. Dig into it deep enough, and it will teach you what you need to know. That’s my story (really, truly) and I’m sticking to it. When I met my husband I was eighteen — old enough to have opinions on how the world should work, young enough to be impressionable. We were both from Pennsylvania, but our childhood environments seemed worlds apart. I grew up in the suburbs of Philadelphia, in a modest neighborhood in a town of modest neighborhoods. My husband, on the other hand, grew up in the country. His grandparents — Ben and Sophie — were homesteaders who gave up their day jobs to become subsistence farmers in the Pocono Mountains. What they grew, they ate. What they needed, they made. Ben and Sophie lived in a stone bungalow they’d built together. The floors were crafted from trees felled and milled on the property, the cedar shingles hand-split. And the land? Planted with seemingly endless flower and vegetable gardens. By the time I’d met my husband’s family, those gardens had gone from three acres to a half an acre. Still enough to feed the entire town. I spent many weekends in Ben and Sophie’s home, sipping coffee and helping his grandmother in the kitchen. She baked bread (and served it slathered in butter), canned fruit and vegetables, and could prepare an amazing meal from the simplest of ingredients. “Go get me some potatoes for lunch” at my house would have meant a drive to the local mega-grocer. For Sophie, it meant going out into the garden to dig a few Yukon Golds. Or maybe a trip to the root cellar in the colder months. At the time, I thought it was all a little quaint and… odd. Why not buy groceries? Why reuse milk cartons to freeze wild blueberries when you could buy Tupperware? Or better yet, why not buy blueberries instead of hiking around the woods for hours picking them? I said I was young. I was also clueless. Then we had a son of our own, and the Sunday dinners at Sophie’s house took on new importance. They were a chance to see the family and spend time with Ben and Sophie. Older now, it was harder for Sophie to do the gardening, but she managed to tend a small but productive plot off the side of the house. Her garden was neat, free of weeds and “organic” before organic was a thing. While throwing together recipes long memorized, she’d tell stories about her childhood in Czechoslovakia or share her favorite poems. She never preached the lifestyle; she simply lived it. More aware of family connections, I came to appreciate how aunts and uncles and cousins came together over these meals. We all sat around a small table in a small kitchen filled with the scents of roasting meats and baking bread. No one seemed to mind a bit of crowding. Those get-togethers were the best. Sophie would make chicken with mashed (fresh) potatoes. Kohlrabi topped with butter. Steamed broccoli. Homemade biscuits. Cole slaw. Cherry cobbler from the sour cherry trees in her yard. She didn’t eat much, but she seemed happiest when everyone else left the table full. I still remember the camaraderie. And I still remember the food. And most of all, I remember how Sophie cared for the land and it, in turn, took care of her — providing her with sustenance and a reason to begin each day. A woman and her garden. Fast forward seven years. I was living back in the Philly ’burbs. My son was now twelve, and I had twin four-year-olds. The stock market had taken a downturn and my husband’s consulting work dried up. We were die-hard organic produce eaters, but Whole Foods was expensive and we were down to one paycheck. So we channeled his grandparents and grew our own. What started as a small plot with tomatoes and cucumbers and lettuces grew until it covered most of our humble third of an acre. We found that we had enough food to feed ourselves — and half the zip code. But we discovered something else, too. The garden — and the food we prepared with it — brought people together. The neighbors stopped by to pick strawberries or tomatoes or to ask for gardening tips. Our kids would sell bundles of fresh spinach or bags of green beans on the corner. We’d have family and friends over for “harvest dinners.” My husband always had the greener thumb, but I began to learn the difference between hard neck and soft neck garlic, between an heirloom tomato and a hybrid. A whole world opened up. And suddenly my husband’s grandparents’ choices made more sense. Their farm was gone by then, sold when his grandfather died and his grandmother entered assisted living. Nevertheless, I realized the power that comes from being able to grow your own food. Especially now, in the age of prepackaged and heavily processed, real food is not only energy, but can be medicinal. Gardening is ultimately about connectedness — to what we take into our bodies, to the land, and to other people. The knowledge Sophie and Ben imparted to my husband and me was invaluable. Sophie died a few years ago, well into her nineties, but her legacy lives on. Fueled by gratitude and warm memories, I realized I could pay homage to her in my mysteries. If you read the Allison Campbell mystery series, Mia Campbell’s humble Bungalow is a fictional replica of Sophie and Ben’s house, down to the massive stone fireplace and the cozy eat-in kitchen. And the Greenhouse Mysteries? Megan and Bibi’s organic farm in fictional Winsome, Pennsylvania, is a tribute to Sophie’s amazing garden. Wendy Tyson is an author, lawyer, and former therapist who writes the bestselling Greenhouse Mystery Series and the Allison Campbell Mystery Series. She and her husband recently moved their micro-farm from Pennsylvania to the Green Mountains of Vermont.